It’s a truism that living organisms require light to survive, yet you’ll find exceptions to the rule if you look in the right places. Deep within a cave, without the faintest glimmer of light, life goes on. But it is life with a difference. Our first experiences underground took place in Mitchel Caverns beneath the vast expanse of the Mojave Desert. The combination of exotic rock formations and the eerie silence made cave converts out of us at once. But at that time we had barely heard of creatures that spend their lives in caves. Another year and another place found us in New Cave in southern New Mexico. New Cave is undeveloped – meaning that the only light therein is the one you carry in your hand. After following a ranger some distance back into the cave, we were asked to sit down and turn off our flashlights. The absolute blackness, the feeling that we were surrounded by nothingness and totally alone, gave us our first understanding that cave creatures have specific reasons for being so different. To begin with, most creatures that live, multiply, and die within caves appear white or slightly pinkish in color. Without sunlight, or indeed, without vision, protective coloration is useless. So over the millennia, normal pigmentation evolved into basic white. Some animals take on a pinkish color where the blood in their arteries shows through the skin. Other creatures are so transparent that you can look right through their bodies and see their internal organs. And a few cave crayfish are totally colorless. The only way you can spot their presence is to watch for their faint shadows swimming around under the light of your lantern. For cave creatures, eyes are only relics of a past existence. Some cave fish have slight indentations where eye sockets once were; others retain eyes but cannot see. Instead most cave animals have enormous feelers so they can navigate by their sense of touch. For example, a blind cave cricket explores its surroundings using antennae more than twice the length of its body. Not all creatures associated with caves spend all of their time inside, however. The cave swallow spends the daylight hours flying around like the rest of its relatives, but when the sun begins to sink toward the horizon it heads back to its nesting site in a limestone cave. Carlsbad Caverns is one of the few places in the United States where you can see these birds, and then only if you stop in during spring or summer. Another creature that leads a dual life, living both inside and outside of a cave, is the bat. It works the opposite shift from the swallows. These nocturnal creatures spend the daylight hours hidden away in caves and other dark places. Although they see well enough outside, in the cave they use sonar to find their way – along with an exceptional memory. A bat flying through the blackness emits a series of ultra-high beeps. The sounds bounce back, locating obstacles in time for the bat to change course and avoid them. When it flies along a well-known path, a bat may cease beeping and fly on memory alone – taking advantage of the fact that the surroundings in a cave seldom change. 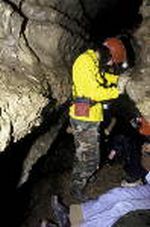 Packrats also rely on memory when inside a cave. One of the few mammals besides the bat to venture past the twilight zone (the farthest point where light penetrates into the cave), a packrat uses its long whiskers when exploring the cave for the first time. But on later visits it moves along at top speed, following its trail by a combination of memory and a good sense of smell. For creatures who never leave the cave, food is a constant problem. Some, such as cave spiders, subsist on their fellow inhabitants. Unlike their web-building relatives, these spiders actively hunt their meals. There’s simply not enough prey available to depend upon someone dropping in for dinner. Many caves contain streams meandering through their underground passages. Whether the water comes directly from the outside or seeps down from above, it carries along bits of animal and vegetable matter that become food for cave inhabitants. But the bat is the best provider. Deposits of nitrogen-rich bat guano, along with dead bats, fleas and other parasites, support much of the permanent life of the cave. Many creatures live directly on the bat debris, but so do molds which in turn provide food for others. Life in a cave forms a tight mesh of interdependence seldom seen on the surface. But a cave isn’t all hardship. It offers several advantages – a lack of competition from the outside world, and a temperate environment with little seasonal variation. Nature’s creatures don’t need many advantages. Where there is room for survival, some will eventually fill the space – even in the depths of a cave.